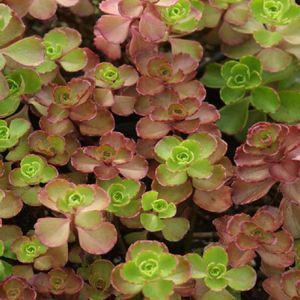 Sedums are fleshy-leaved, low-growing plants that come in a wide range of forms and colors, very useful for late season bloom and foliage color well into the winter. ‘Fuldaglut’ has green-bronze foliage 3-4” high that flowers deep red in July and August at that height. This small Sedum is enchanting in the rock garden as a ground cover. 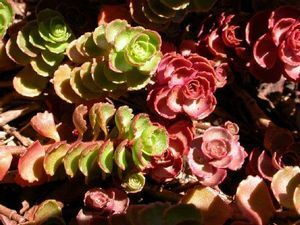 Considered an improved variety of ‘Dragon’s Blood’ Sedum.